They feed off the plants leaves, causing plants to die or the fruit to not develop properly. Timings They start to lay eggs during Spring which will hatch in 2-3 days, with the nymphs becoming adults in only a week. Red Spider Mite is a major problem affecting houseplants, greenhouse plants, ornamentals and edibles. What are Red Spider Mites? 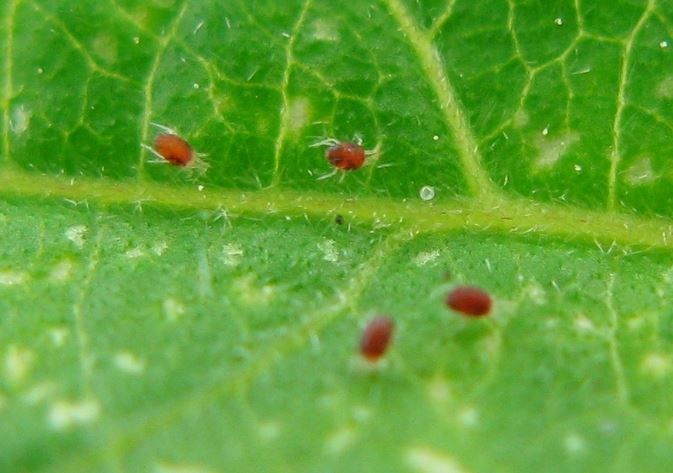 Red Spider Mites are part of the arachnid family and are related to all of the spider family. They are common in houseplants, crops under cover and outdoor plants in the warmer summer months. They use their mouths to feed on the contents of the leaf cells starting from the underside of the leaves. It is the cells dying that creates the brown speckles on the leaves. The spider mites are identifiable by their light green colour, with 2 dark spots on their back (not red as the name suggests). During periods where they are less active they will become red/ dark orange. An adult female mite can lay up to one hundred minute eggs in a lifetime and will become most active as the temperatures increase – usually beginning March and April. Eggs will hatch in a few days and the mites can begin feeding. A mite will begin its life with 6 legs but will develop 2 more as it ages. A mite will produce a fine silk webbing which is used as a protective barrier for the spider mite colony from predators and unsavoury environmental conditions. Spiders will also use them to spread the mite colony to other areas of the plant. As temperatures begin to fall, the female mite will stop laying eggs and find somewhere to overwinter. This could be old plant material (which one of the reasons why plant hygiene is imperative). Leaves: A fine, pale mottling with brown speckles on the upper surface of the leaves can be seen. There will also be tiny yellow/ green mites, egg shells and tiny white cast skins. If you place a piece of white paper under the surface of the leaf and tap or shake the plant, you will see the mites as tiny specks moving across paper. Tiny eggs will be seen as black specks and you might also notice white skin castings.